Throughout the schema definitions, a consistent use of common attributes should be enforced. The following list should serve as guidance for schema developers. 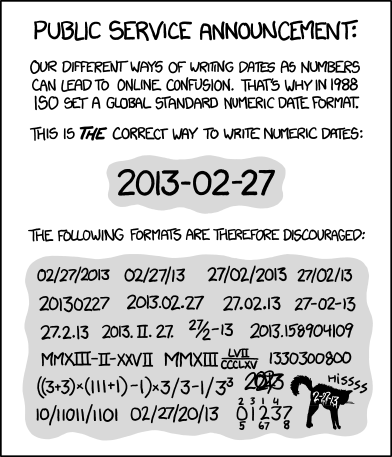 Date and time formats are specified as ISO8601 compatible strings, both for time points as well as for intervals and durations. An optional required granularity may be specified as part of the respective attributes’ documentations. Time points with year granularity are both common for obfuscated personal data as well as technical metadata (e.g. year of publication of an analysis). This represents the standard way of representing a specific day, e.g. a date of birth. Timepoints with millisecond granularity are typical use cases for timing computer generated entries, e.g. the time of a record’s update (“updateTime”). Durations are the most common form of time intervals. They do not refer to (e.g. start or end) time points. They are indicated with a leading “P”, followed by unit delimited quantifiers. A leading “T” is required before the start of the time components. Durations do not have to be normalized; “PT50H” is equally valid as “P2T2H”. A frequent use of durations in biomedical data resources are age values, e.g. “age at diagnosis”; but also “progression free survival”, “followup” or “time to recurrence” (these are descriptive labels, which do not necessarily represent GA4GH schema use). This would be the standard annotation for the commonly used age in years, without relation to a date of birth. This represents an age with added months specification. A common use for durations is the recording of time points in time series, e.g. experimental interventions and observations (collections of cells from an in vitro treatment experiment; recurring drug doses in a chemotherapy treatment). Time intervals consist of a combination of two time designators. These can be either two time points for start and end, or one time point and a leading (time point indicates end) or trailing (time point indicates start) duration. The time elements are separated by a forward slash “/”. While such anchored time intervals represent an option to capture different time features in a single value and to avoid disconnected references, in the context of the data schema, anchored intervals will presumably be used less frequently, with a qualitative anchor (“date of diagnosis”, “time of sampling”) representing the point of reference. This value captures both the date of birth (here November 21, 1967)and the age (here 40ys, 10 months and 5 days) at a given time point, e.g. at the date of a medical diagnosis. This example demonstrates use of an calendar anchored interval, with given start and end date. A typical example would be the use in medical records, e.g. for a treatment cycle; however, use for data exchange and mining purposes would be less common and usually served with a “duration” (see above). Here is an example for a short term intervention of a 30 minutes duration, e.g. the celebratory exposure to a diluted sample of EtOH with various organic trace compounds, to celebrate the arrival of the new year.